Word spread quickly earlier today that former US President and UM football player Gerald Ford would be honored as a Michigan Football "Legend" at some point during the 2012 football season. Ford's #48 is currently one of five numbers currently retired by the program. Upon becoming a "Legend", Ford's number would go back into circulation and would receive the same special patch treatment that the #21 jersey receives to honor Desmond Howard. The idea, although not officially stated, is that a senior should wear a Legend's number. Junior Hemingway wore the #21 last season, and this year Roy Roundtree switched from #12 to #21 to honor Desmond. Well, per this UM media release, Ford won't be alone in 2012. Bennie Oosterbaan's #47 and Ron Kramer's #87 will also receive the same Legend treatment. That would leave only Tom Harmon's #98 and the three Wistert brothers' #11 as the two remaining retired numbers in the Michigan Football program. No word yet as who will wear the #47, #48 and #87. Would have been cool to have Ford honored at the Air Force game – given his former, somewhat famous role as Commander-in-Chief, and all. 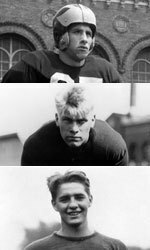 ANN ARBOR, Mich. – The University of Michigan Athletic Department will recognize three of its all-time great football players – center Gerald Ford and ends Ron Kramer and Bennie Oosterbaan – with the “Michigan Football Legend” distinction during the 2012 season, announced today (June 12) by Dave Brandon, the Donald R. Shepherd Director of Athletics. The Oosterbaan, Ford and Kramer families fully support the return the famed No. 47, No. 48 and No. 87 jerseys into circulation starting this fall. Oosterbaan, Ford and Kramer will be honored in perpetuity with their names always affixed to the No. 47, No. 48 and No. 87 jerseys, respectively. A patch over the left upper chest will be affixed to the jersey of all future players donning the jersey numbers. The football staff has not determined which current players will wear the jerseys honoring the former legends. In addition to the permanent patch, Ford, Kramer and Oosterbaan will be featured in a special area to be designed and constructed in the soon-to-be renovated Schembechler Hall. And, the lockers to be used by No. 47, No. 48 and No. 87 in both the Schembechler Hall and Michigan Stadium locker rooms will be customized to reflect the fact that Bennie Oosterbaan, Gerald Ford and Ron Kramer will forever be Michigan Football Legends.